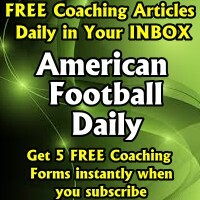 American Football Monthly - 3-STEP PASSING ROUTE CONCEPTS - Various ‘concepts’ gives the quarterback run and pass options for each play. The foundation of our passing game is built on the three-step passing game. Over the years we have combined a variety of concepts for our three-step foundation to make these concepts more difficult to defend. 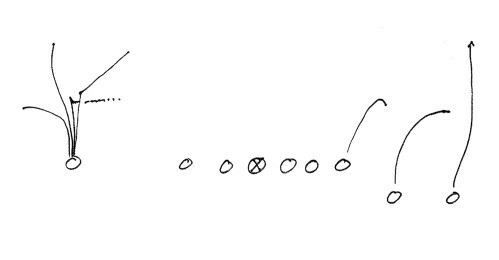 These are the staples of our three-step passing game. • This is a concept used extensively to beat soft coverage by the corner. • We use it by calling a run in the huddle followed by the word “Now”. 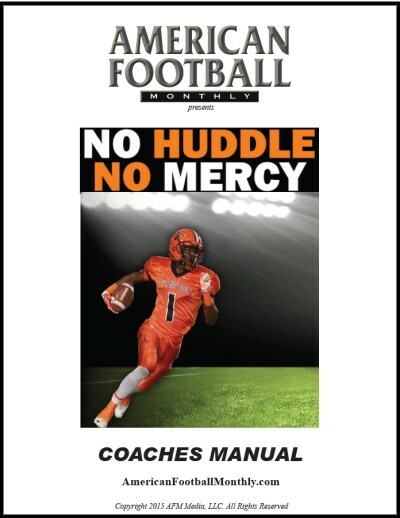 • The term “Now” alerts the QB and WR’s that based on the depth of the coverage (7 yards or greater) the QB has the option on the snap of the ball to stand up and throw a “Now” route to our receivers. • On a “Now” route, the receiver simply turns his numbers to the QB on the snap, catches the pass, and makes a defender miss. 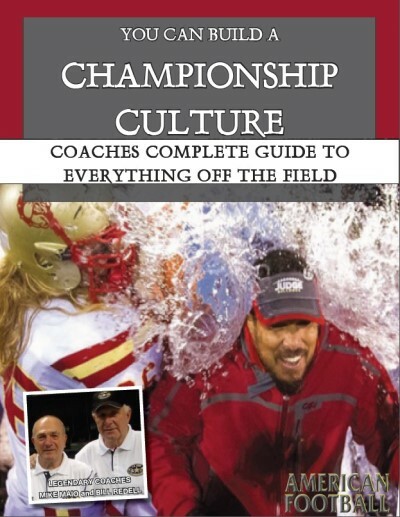 • The rest of the offense merely executes the run play that was called in the huddle and blocks it like a run. • Similar to our “Now” concepts are the “Look” concepts. The “Look” concept is called exactly like the “Now” concept in the fact that we tie a run together with it. 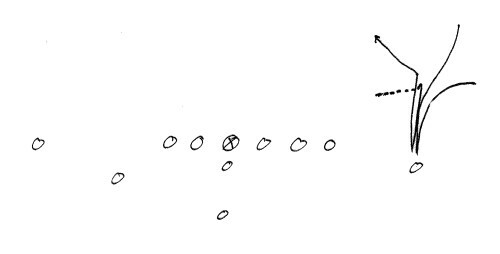 • However, the “Look” concept has the receivers running quick slants. • We use this concept versus heavy blitz philosophies because it allows us the opportunity of making a big play on down and distance situations. 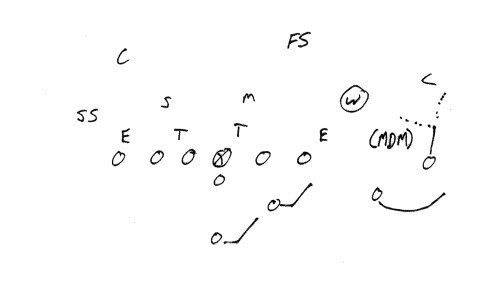 • The entire offense runs the play called in the huddle but the two WR’s run slant routes to beat man coverage. • Each side runs a quick concept that is independent of the opposite side of the formation. 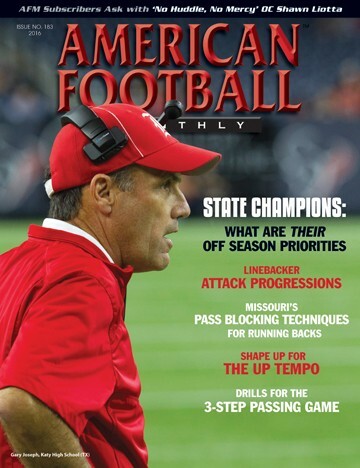 • When playing a defense that plays multiple coverages or you want to assure the best chance of success, call one side of your formation to beat a specific coverage and the other side to beat a different coverage. • This is a new concept we used a little last year and are looking for ways to expand in our package. • A “Kill” concept has two plays called in the huddle. For example: Queen Right 41-42 Kill 24. • When the QB goes to the L.O.S. he decides if the play called is viable. • If it’s not, he just calls, “Kill, Kill” and we run the second play that was called in the huddle. • We put this into our quick game for purposes of not having to audible to the corresponding run. • One of our most exciting concepts for our quick game is our run/pass combination calls. • We call both a run and a pass in our play call and then the QB makes the decision on which play to run based on the scouting report. • The TE, OL, and RBs run the run play, the WRs run the pass play, and the QB decides which play to run. offensive linemen will not be downfield. • Another “Now” concept that we have implemented the past few years is our quick game on one side and sprint out concept to the other side. • We use this concept out of our 3 x 1 formation. • The X receiver (SE) runs a quick slant route – if it’s there, the QB throws it in rhythm. • We teach the QB to stare down the route and if it isn’t there he then sprints out to the opposite side of the formation and, depending on the route called, he reads an intermediate combination route being run. • We use full slide gap protection to make this route work. 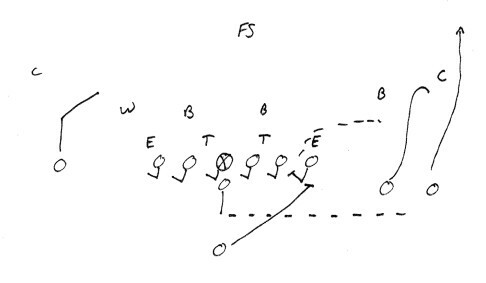 • An important aspect of this route is that the TE is used in the slide protection and then, after blocking his gap, he leaks out into the flat just like a naked or boot concept. • This is one of our oldest concepts but still one of the most effective concepts. 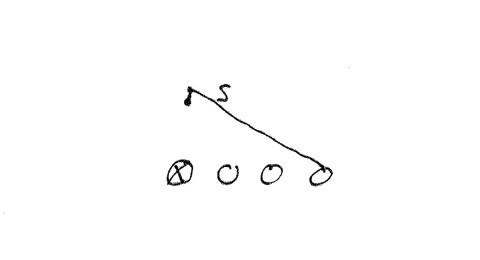 • In our 3 x 1 formation we give the single receiver a choice to which quick game route he wants to run based on the coverage. • It requires the receiver and the QB to be on the same page but with a good WR this is very difficult to defend. • This is a standard concept for us. 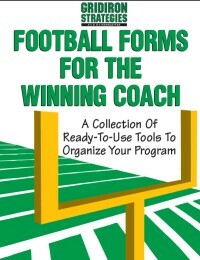 • “Check With Me” concepts give the QB two choices: a run and a pass. • The QB checks into the play at the L.O.S. • How this concept differs from the “Kill” concept is that we tie about four absolute “Check With Me’s” into our packages. • QB comes to the L.O.S. and determines whether we are going to run it or pass it based on the defensive alignment. • This is a route that we have developed over the years when we want to get the ball to a receiver who has reliable hands. 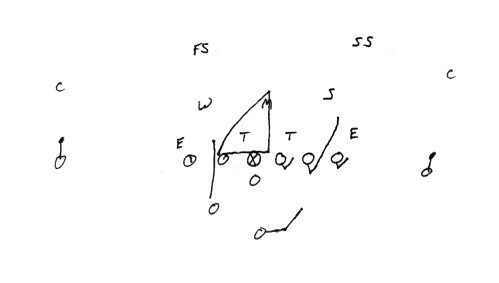 • The “drive” is a route where the receiver makes an adjustment to the coverage he gets. • The QB must see the same things as the WR. 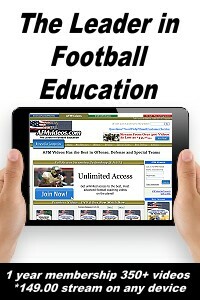 • For years we have tried to get our TE involved in our 3 step and our entire throw game. 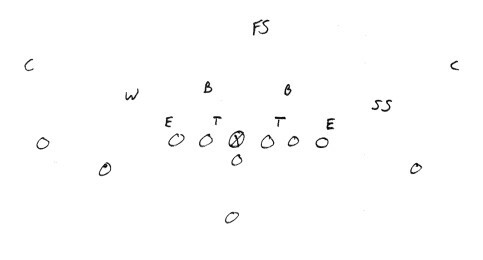 • One of our favorite concepts is to add the word “Y spot” as a route to control the underneath drops. • The spot concept tells the TE to inside release and set up at a spot at five yards deep over the alignment of the center. • We use a variety of double move routes. 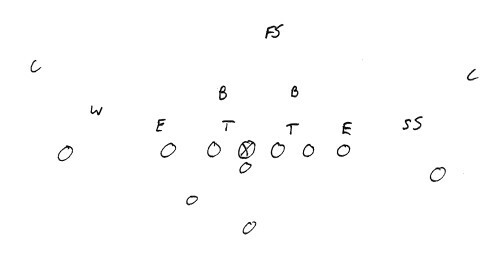 • We add the word “stutter” to the number and it tells the receiver to double move the route. About the Author: Stan Zweifel just finished his seventh season as head coach of the University of Dubuque. He previously coached at Minnesota State-Mankato where he served as offensive coordinator. Zweibel also coached at Wisconsin-Whitewater from 1991-2007. He was a head coach at both Minnesota-Morris and Yankton College.